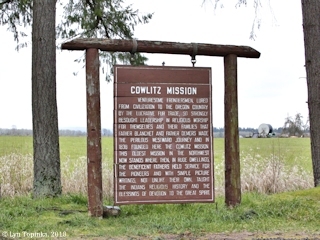 "Cowlitz Prairie, Cowlitz Farm, Cowlitz Landing, and the Cowlitz Mission"
Click image to enlarge Information sign, Cowlitz Mission, Toledo, Washington. Image taken March 29, 2018. 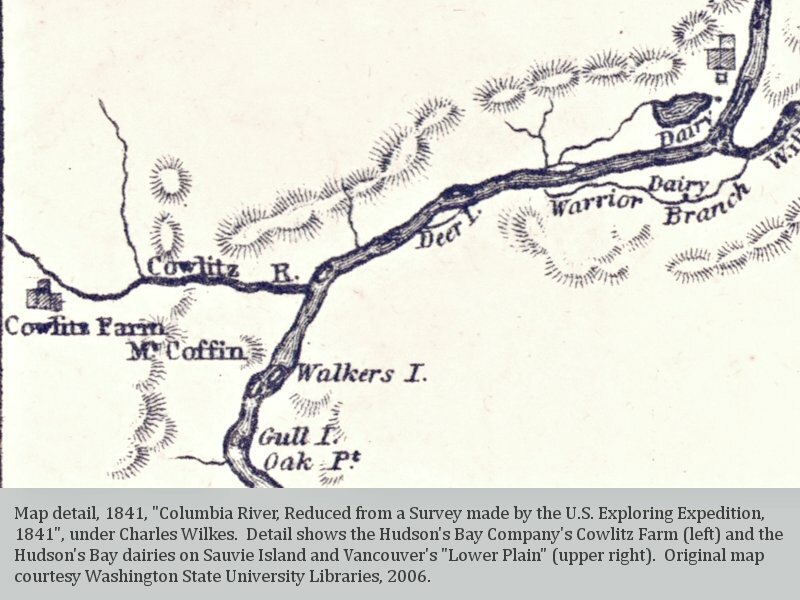 "The Cowlitz Portage was the termination point of river travel from the Columbia, and the embarkation stage for the overland route to Puget Sound. The farm was established on Cowlitz Prairie, one of many prairies alternating with forests, located between the landing and Fort Nisqually to the north. The prairie was about a mile from the landing. Its size varied, according to who did the estimating: William Tolmie thought it was about four miles long and one mile wide; Duflot de Mofras thought it was six by two miles, James Douglas said the plain "... contains a surface of about 3000 acres of clear land." The site, Douglas said in 1839, had the disadvantage of "... being separated from the River by a steep, rugged hill impracticable in its present state, to wheeled carriages: and the excavation of a convenient road, will be an enterprise attended with great labour and expense." 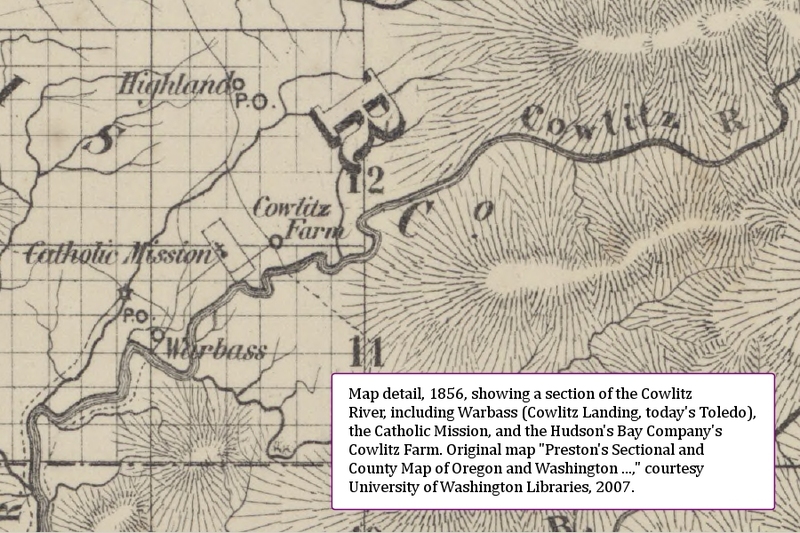 Lietuenant Charles Wilkes, who arrived overland from the north in 1841 noted the farm was located on "an extensive prairie on the banks of that river [the Cowlitz]." ... "
Source: Fort Vancouver Cultural Landscape Report, 1992, U.S. National Park Service. Click image to enlarge Cowlitz River at Toledo, Washington. View looking upstream, taken from the Highway 505 bridge. Image taken March 29, 2018. Click image to enlarge Flag, Hudson's Bay Company, Fort Vancouver, Washington. Image taken August 27, 2006. 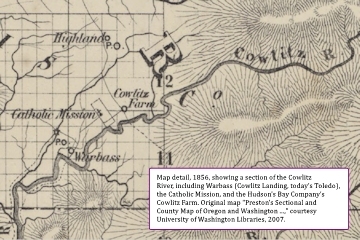 Click image to enlarge Map detail, 1841, Cowlitz Farm to Fort Vancouver, by Charles Wilkes, U.S. Exploring Expedition. Map shows location of the Hudson's Bay Company's Cowlitz Farm. Original Map courtesy Washington State University Libraries, 2006. Click image to enlarge Map detail, 1856, Cowlitz River including Warbass (Cowlitz Landing, today's Toledo), the Catholic Mission, and the Hudson's Bay Company's Cowlitz Farm. Original Map "Preston's Sectional and County Map of Oregon and Washington ..." courtesy Washington State University Libraries, 2007. "COWLITZ FARM, one of the early homes of white men in Lewis County. Retired employes of the Hudson's Bay Company settled there. 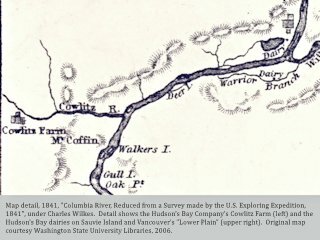 It is indicated on the maps of the Wilkes Expedition, 1841, and also on Preston's Map of Oregon and Washington West of the Cascade Mountains, 1856. In 1858 the Legislature passed an act to located the proposed Territorial University of Washington at that place." The soil at Cowlitz was rich, and far better suited than that of Nisqually's for crop production. Over the years, the Cowlitz farm became the chief grain producer for the P.S.A.C. Land was rapidly put into production: by the spring of 1840, six hundred acres had been ploughed, and by the fall of 1841 one thousand acres were under cultivation. At the time of the 1846-47 inventory, 1,432 1/2 acres were under cultivation. Crops included wheat, oats, barley, peas, turnips, beans, cole seed and potatoes. ..."
By the spring of 1840, some houses had been built, and by the spring of 1841, when Charles Wilkes visited the site, a dairy was in operation, and both a gristmill and sawmill were under construction. 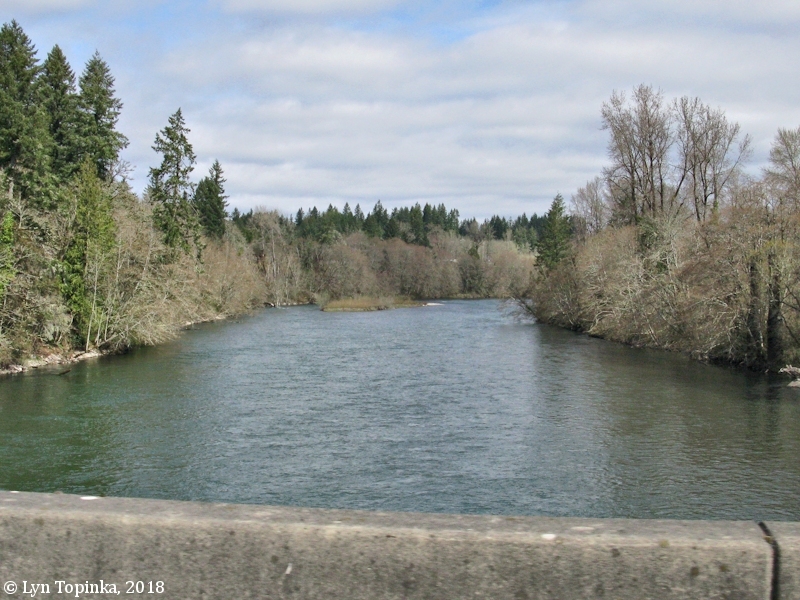 In 1845-46 a dwelling, granaries and outbuildings were erected at the mouth of the Cowlitz River to store the farm's produce until Company vessels could pick it up. ..."
Until 1856, minor operations of the company continued to be conducted at the farm, although encroachments by Americans had significantly reduced its holdings. In 1859, Roberts made arrangements to occupy the reamining Cowlitz Farm lands and buildings for the Puget's Sound Agricultural Company to maintain its claim to the property until settlement of the company's claim with the United States; his obligation was to keep the buildings in good repair. From that time until 1871, when Roberts left for Cathlamet, Washington, he was embroiled in a number of disputes with Americans who refused to recognize the company's claims to the land. The granaries built at the mouth of the Cowlitz were, by 1854 in poor condition. In 1857, according to Dugald Mactavish, the buildings - but not the land - were sold to an American." "The farm establishment is situated on a large plain about 500 yards from the river, and about one mile from the landing place; there is a small settlement of about 19 families, and a Roman Catholic church in the immediate neighborhood. There are large herds of cattle and flocks of sheep, and bands of horses at this point." Source: "Lieut. Vavasour's [Engineering] Report", March 1st, 1846, IN: Joseph Schafer (editor), 1909, "Documents Relative to Warre and Vavasour's Military Reconnoissance in Oregon, 1845-6", The Quarterly of the Oregon Historical Society, March 1909, Vol.X, No.1. "COWLITZ LANDING, near the present location of Toledo in Lewis County. Boats were used on the Cowlitz River up to this point, from which passengers would proceed overland to Puget Sound. The name appears on early Territorial maps." 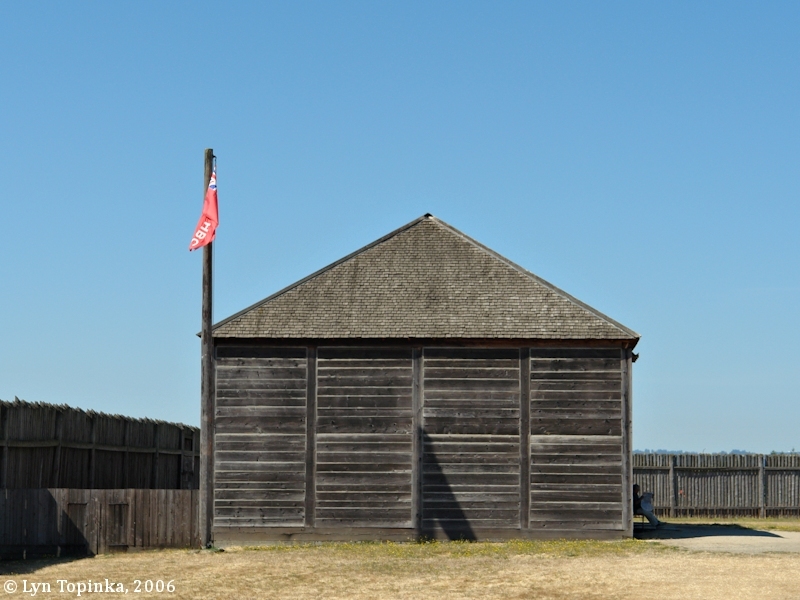 Cowlitz Landing: "A very important early settlement, 15 miles south of Chehalis, southwest Lewis County. Founded in 1837, it was a River landing, a trading post, the site of a Roman Catholic Mission, and headquarters for a very large farm operated by Puget Sound Agricultural Company, a subsidiary of Hudson's Bay Company. The first name was Plonondon's Landing, for the owner of a Donation Land Claim at this place. Later the accepted name was Cowlitz Landing. A later name was Warbassport, and the present name is Toledo." "Just east of the historic Pacific Highway north of Toledo lies one of the most important pieces of cultural history in the Pacific Northwest. St. Francis Xavier Mission, more commonly known locally as the Cowlitz Mission, is the oldest operating Catholic church in Washington. Constructed in 1838, the mission was built more than a half-century before Washington became a state and 15 years before the formation of Washington Territory. An article in the Chehalis Bee-Nugget in the 1910s describes the importance of Simon Plamondon, a retired employee of the Hudson’s Bay Company, to the Cowlitz region. Plamondon is locally regarded as a pioneer of the area as he took a land claim on the prairie; he would later set aside a room in his home for a ceremony to establish the St. Francis Xavier Mission, according to the Catholic Parishes of Lewis & East Pacific Counties. The mission essentially played a huge role in merging the two cultures, as Father Francois Norbert Blanchet used a device known as the “Catholic Ladder” to relay the stories of the Bible and modern history to members of tribes who wished to hear of the Great Spirit. That ladder was copied and replicated by many other missions throughout Washington, Oregon and even British Columbia. A replica of that ladder exists on the property today, with a guide that explains the symbols on the ladder from the account of the crucifixion to the establishment of the church. The ladder that exists on site today was carved by Fred Echenberg, a member of the Cowlitz Tribe and master woodworker. As for the history of the early days of the church, not much exists as its early records were destroyed in a fire in 1901. Another fire in later years resulted in needing to rebuild the church into the structure that stands today. A cemetery on the property is about 7 years older than the actual church itself, having been maintained at first by the Hudsons Bay Company in the early 1830s. Early records of the cemetery don’t exist, but several early settlers in the area are buried there in a beautiful piece of land that overlooks the prairie below and Mount St. Helens in the distance. Several important names in Lewis County history are buried here, including Simon Plamondon himself. Church members take care of the grounds and maintain the cemetery and its headstones very well. Today the church’s name still reflects its origins as the St. Francis Xavier Mission, and its congregation proudly celebrates its 177th year of operation." 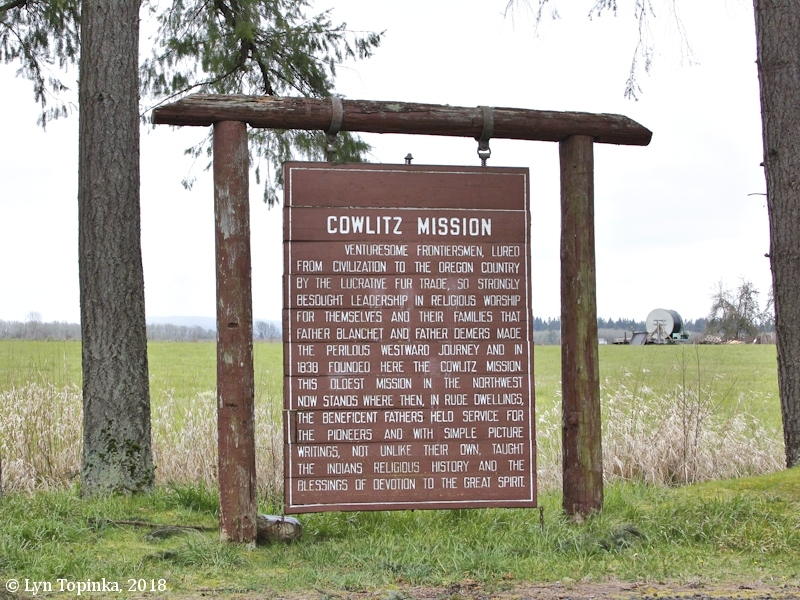 "With an elaborate program, a beautiful tablet was erected on Cowlitz Prairie on May 11, 1926, to mark the site of the Cowlitz Mission of 1838 and the first Catholic Church in what is now the State of Washington. The tablet was erected by the Washington State Historical Society and the Knights of Columbus." Source: Washington Historical Quarterly, July 1926, Vol.17, No.3. "Venturesome frontiersmen, lured from civilization to the Oregon Country by the lucrative fur trade, so strongly besought leadership in religious worship for themselves and their families that Father Blanchet and Father Demers made the perilous westward journey and in 1838 founded here the Cowlitz Mission. This oldest Mission in the northwest now stands where then, in rude dwellings, the beneficent Fathers held service for the pioneers and with simple picture writings, no unlike their own, taught the Indians religious history and the blessings of devotion to the Great Spirit." Source: Information sign, Toledo, Washington, visited March 26, 2018. "The church that stands presently on this site has been in place since 1932, but the history of St. Francis Xavier Mission dates back to 1838. The first mass on the Cowlitz Prairie was held at the home of pioneer Simon Plamondon, and the mission was assigned a priest in 1839. There has been a Catholic congregation at this spot ever since! A replica of the Catholic Ladder, which served as a visual teaching aid for Native Americans in the area, stands on the southeast side of the church. A cemetery that is the final resting place for many of the area's pioneers, including some who emigrated from Ireland and Scotland, adjoins the church." Click image to enlarge St. Francis Xavier Mission, Toledo, Washington. Image taken March 29, 2018. 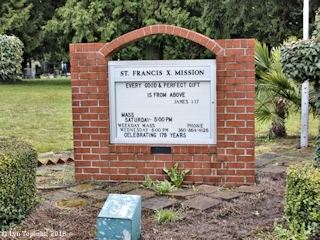 The St. Francis Xavier Mission Cemetery, also known as the Cowlitz Mission Cemetery and the Calvary Cemetery, is believed to be the second oldest continuously operating cemetery in Washington State. The cemetery originally was associated with the Hudson Bay Company's "Cowlitz Farm" (established in 1832) before becoming a part of the Catholic Church ("Cowlitz Mission") in 1838.